It's amazing to me that I can't seem to find any threads (anywhere) about Google's tentacles that go deep into the Android OS to track just about everything we do on these phones. "To view your local weather information, turn on Location settings and make sure the ode is set to High accuracy." "Let Google help apps determine location. This means sending anonymous location data to Google, even when no apps are running." So to get the weather on my home screen, I need to let Google ALWAYS record my current location? Why isn't GPS good enough? I know that high-accuracy isn't required because it's not like the weather is any different 20 meters away. It seems like extortion. Are there any threads about how to use this phone well without giving it up to Google? 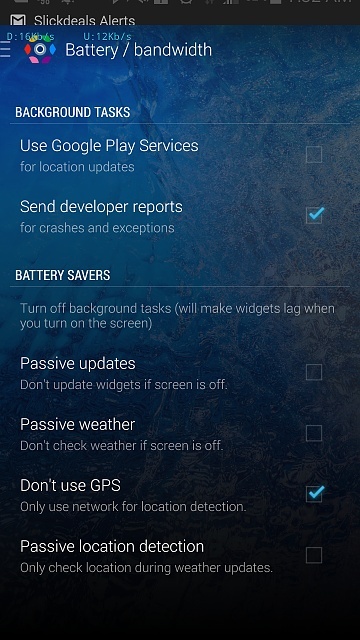 I believe you can download some third party weather apps where you can setup the location manually without allowing it to use your GPS. Google wants to have people use GPS so it will show weather no matter where they go so they don't have to manually change it. I would say most don't care if Google knows where they are. I mean if you really think about it your cell carrier can track your location 24/7 due to cell towers. Maybe not 100% accurate like GPS but they can easily draw a map of where you go every day so .. there really is no "privacy" anymore . I believe you can download some third party weather apps where you can setup the location manually without allowing it to use your GPS. Yes. 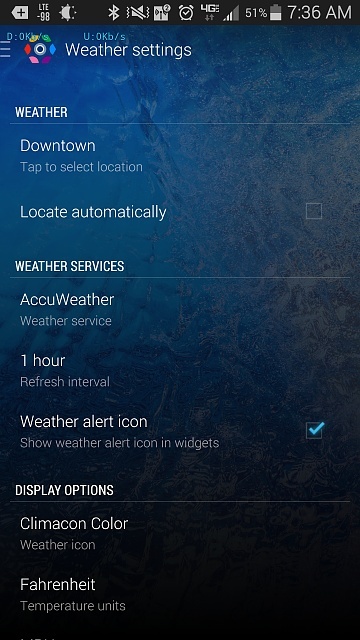 1Weather has an option to follow your location in it's own settings. You can also set a specific location and not use location services at all. You would be somewhat limited without using Google services. But it can be done. You can use amazon or Samsung for apps, and avoid Google Apps, don't sign into your Google account. Google wants to have people use GPS so it will show weather no matter where they go so they don't have to manually change it. I don't mind them using the GPS. They want more than just GPS. They want "High Accuracy" mode which also uses WiFi & mobile networks to get my location. GPS should be enough, but they don't get to have permission to collect my location if I just use GPS. It's really unfortunate that people are okay with the lack of privacy. It's wrong. And I don't mind using Google services. I just don't want them to keep a log of everything I do. it is a Fallacy that inserting the use of WiFi will improve the location accuracy of your device. That is pure hogwash, nothing else... just a way of them wanting to be able to get into your phone anytime they want. I always keep Wifi and Data turned OFF when the phone is asleep.... better battery life that way. Do a ping on your IP address, that will prove it fast enough. Of course it could also be argued that it may be a good thing if your location is known at all times. I can't think of any obvious way in which it would be bad. I for one don't have the sense that my true privacy is being invaded by these things. If I did, and didn't like it, I could switch things off. True -- Just a difference in opinions from different people. I really don't care that Google knows where I am... I really have nothing to hide. It is not like anyone couldn't find out where I work, live, and visit if they really wanted to. Just makes my life easier with certain tasks by it knowing things . I think this is about to become a philosophical discussion. I really have nothing to hide. The day someone wants to target you, all of that information will be remarkably useful to them, even if you haven't done anything wrong. If someone you've ever known happens to know someone associated with a terrorist, if you've driven too close to a bank robbery or a murder, or if you ever bought something you can't really afford, that's a good start of a case that you're a terrorist, bank robber, murderer, or tax evader. Trusting some 3rd party that we don't really know isn't a good long-term solution. I could go on... I just wish I could protect my phone from it to some extent. Is there a good permissions-based security system for any app I might install? Would I need to root the phone to make that happen? Hehe you can believe what you want -- I just tender to disagree. I am not worried about them thinking I am a terrorist since I am not ... and I am not trusting a random 3rd party .. I trust Google more than some random app in an app store. I am sure if evil things were being done by Google it would be more widely known. You can't legally disable location services completely. You can turn location services off but the government can still access this information. If this is the primary concern then buy a phone without a GPS. But keep in mind that these would have to be very old phones as the government has required gps for some time now. Also Verizon will not activate a phone without gps on its network anymore. Anyway, to modify permissions, you can use app ops which is from the play store, but it might or might not work on your device. Keep in mind the government can still get location information, even if it is disabled. Almeuit and Aquila like this. dpham00 has a good point, but to any who want to alter app ops, be advised: this can cause apps to misbehave. Oh, I know that the government can track the hell out of me. For right or wrong, that ship has sailed. They've got all of us wired. I just don't want to give up any additional information that I don't need to. That's all. And it seems ridiculous that they want access to so much information just to tell me the weather. I don't worry about it. What are they going to do if they know where I am? Nothing. Tin foil hats are funny. I know you want to keep Google but To be honest, if you are super worried about permissions, go with Apple. They are way more locked down and any app looking to use things like location services or camera must be explicitly approved by the user. This is true -- no app on Apple can do anything without asking you explicitly for it first. My S5 wont auto rotate. & The hell that is Samsung Support. What to do? Help!